My primary mode of transportation is, well, my feet. I live and work in DTLA, thus is the main reason I don’t need a car. However, to my dear friends of the city government, why oh why do you make my walk so difficult sometimes. Seriously?! I understand the need for working on the pipes or whatever it is you are doing under there and I fully support that, but is this really sturdy enough? I know the physics of how this could be possible, but let’s discuss this a little. I walk along this sidewalk nearly every day. 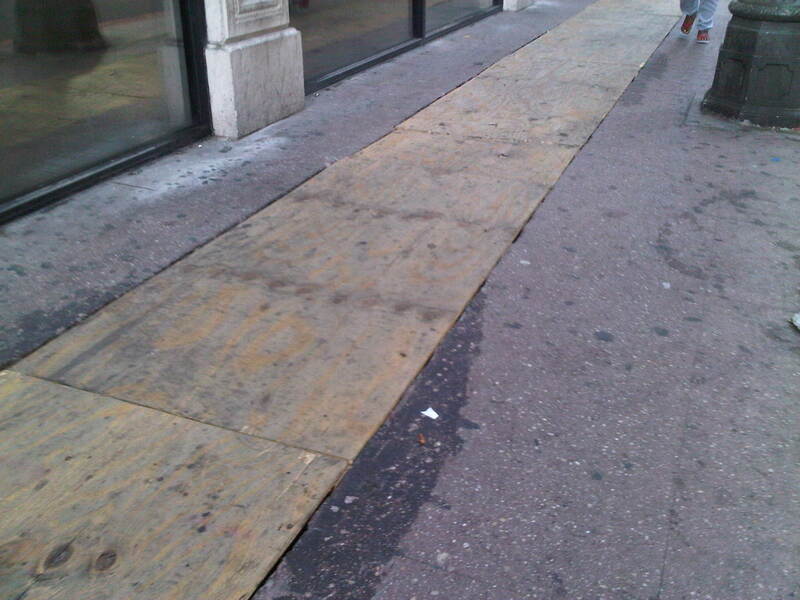 When I have been FORCED to walk on these boards, they creak and shudder and tend to lift in certain places. Now, I am not a very large individual, so if I’m nervous walking on these boards then I would think there are many others that feel the same way. To make matters only slightly worse, when you were actually working on this side of the sidewalk and soldering with sparks flying, people were having to move closer to the street to get by. Normally, not a horrible option. However, when cars get a little too close to that sidewalk, I and other walkers were nearly…well…I won’t say it. So, if it so happens that I fall through a hole in the ground, you, dear City, will have some ‘splainin’ to do! But in the end, it sure as hell beats driving. You have an amazing route too. And stopped those pesky insurance statements. And give me some wonderful time to read. Just call me and we will flee. Though I catch the metro or bus multiple times a week, I’ve only taken an Amtrak once in Los Angeles–Los Angeles to San Diego. I was really excited, because I had never been on a real train before. Though I guess technically I still haven’t because I was quickly informed…umm…this is a commuter train and not an actual passenger train. Fine, way to steal my thunder there friend, but I forgave you. In the end, he was right because all I really remember from the excitement of that trip was the conductor on the loud speaker yelling at us that we may be oversold and if anyone is sitting in the area where the seats face each other then we better be traveling together to the same destination or else. I’m not sure what the consequence really would have been had someone realized that most of the passengers sitting in those areas were not traveling together. It was a bit anticlimactic really. Oh, and if you are an Angels’ fan or Anaheim Angels of Los Angeles or whatever they are calling the team these days, the Amtrak drops you right in front of the stadium. Just an FYI there. Anyway, I still love trains. If you love trains too, then on May 7 you can celebrate that love at National Train Day. 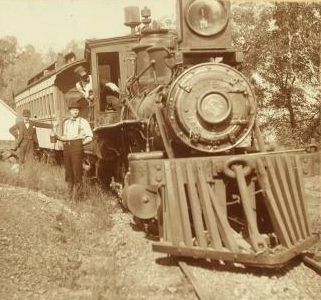 National Train Day is an annual event that started in 2008 to celebrate the inception of the transcontinental railroad (according to my very reliable sources at wikipedia and the amazing and always helpful internet). Also–and I realize that my nerdy qualities might be taking over in this post–I am very excited to see the East Meets West Exhibit. Photographs from the 19th century depicting the Chinese contribution to building the railroad?! Yes, please. I use the term FOB almost every day. I have a key FOB to take the elevator in my office building. 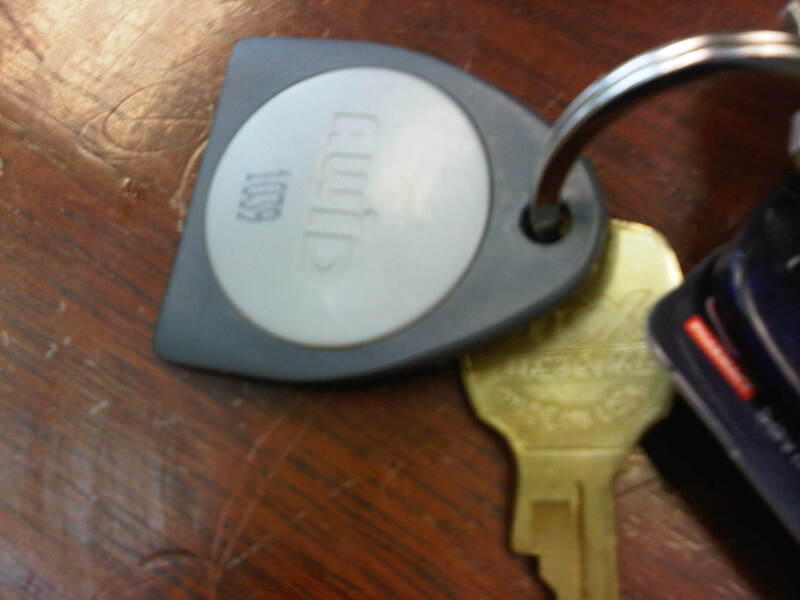 I had a FOB to get remote access to my office network at my old job. But have you asked yourself why in the world is it called a FOB? I was asked that very question recently by a couple of friends. I stopped for a moment and realized…I have no clue. Even researching on the ever informative interwebs resulted in nada. A FOB is a FOB because that’s what someone decided to name it. Though, I guess I could start referring to it as a “key card scanny thing” as my roommate does. I’m not quite to that point yet. Yes, this strange almost triangular shaped thing is how I get access to LAX Car Share. Step 1: Go to the LAX Car Share website and apply for the program. It’s quick, it’s easy and it’s not too expensive. I even think there might be a promotion going on right now. Step 2: Once you’ve been approved to join the car share program, you get one of these fun little thingamabobs aka the FOB. Step 3: You want to take a drive somewhere or you’re running late and just need a car. 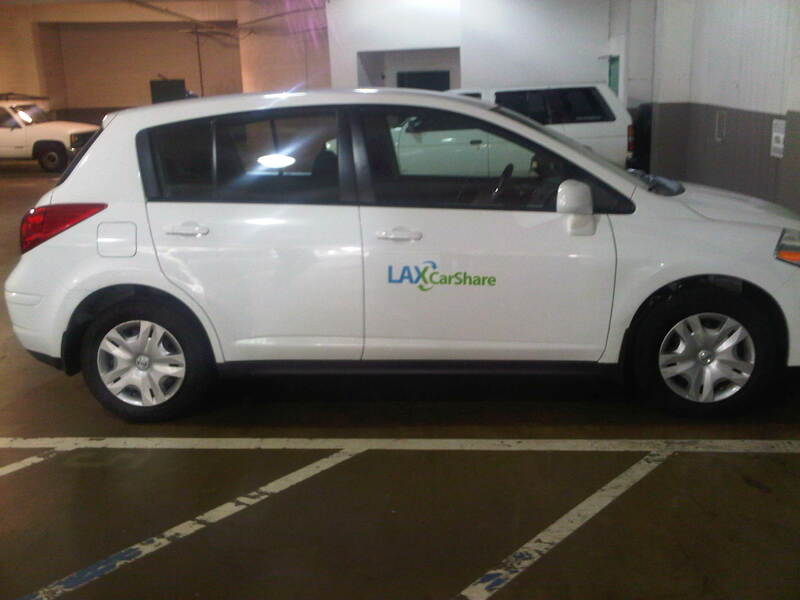 After approving your membership, LAX Car Share will give you login information for their website (an ID and temporary password). You login, go to Make a Reservation, enter in an address where you are and search for the nearest car. The site will tell you if a car is available or not and then let you make a reservation. The website is fairly user friendly, but my favorite part about the whole thing are the directions as to where the cars are located. Anyone can say “Go to the garage on 8th and Olive and pick up the car.” Have you been to that garage? Did you know there are like a million floors? If the website didn’t tell me that the car is located on the first floor next to the admin office and across from the shared ride vans, I may not have ever found it. I really don’t have the best sense of direction no matter what I say. I readily admit it. Google Maps, I ‘m seriously in love with you. I stood there like an idiot for a few seconds because I forgot where this swipey box was located the first time I picked up the car share. So there is the mystery unfolded for all of you. Now just take your FOB and swipe over that swipey box (hence the name). 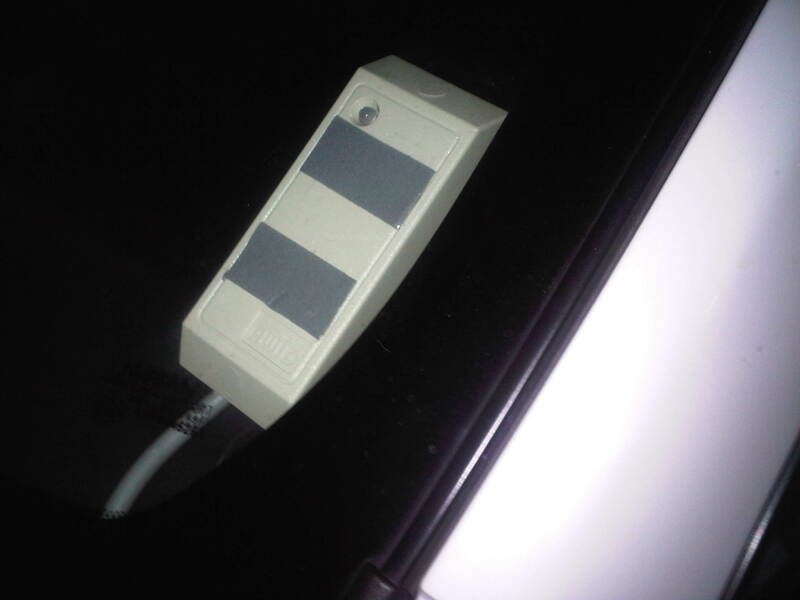 The car should unlock. If it doesn’t, there is a number to call or usually someone in the parking garage is around that might be able to help. I have not had any problems yet. Step 5: OK, now I’m in this unlocked car. Umm…what about keys?! Yeah, well most of the time the keys are left in the glovebox. There have been a couple of times, and I’m not naming names (mostly because I don’t know who was driving before me) when the keys were not in the glovebox. I eventually found them in the pocket next to the driver’s seat. The next question I get a lot is what do you do when the car needs gas. Now this is the best part. 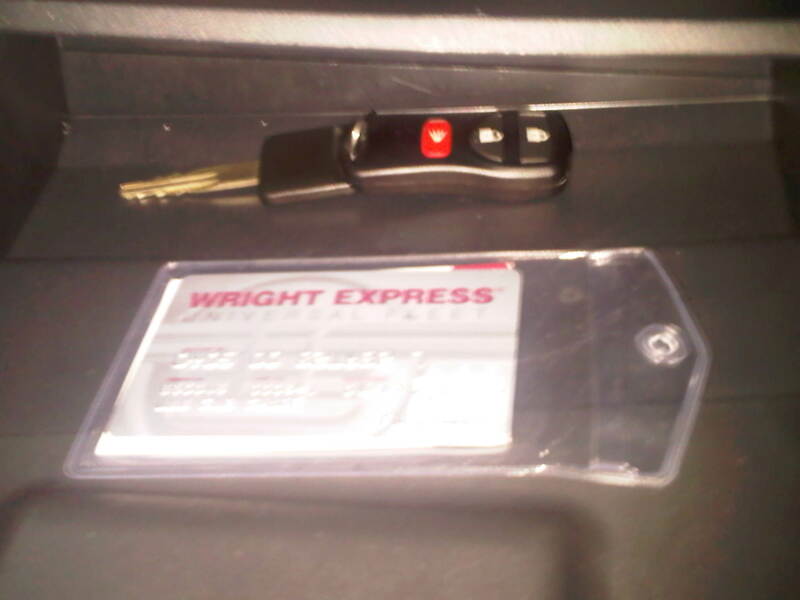 In the glovebox, where hopefully you find the keys, is a card that you can use to get gas. I’m not a master of gas pumping in these cars yet, because lately when I’ve needed the car someone else has already filled the tank. However, I did it once and it was pretty simple. You put the card into the machine like a credit card, it asks you for your car share ID number and the mileage on the car. Then, voila, you can pump gas. Like magic. There are also step-by-step instructions in that nifty little plastic thing where you find the card. LAST BUT MAYBE THE MOST IMPORTANT THING…REMEMBER WHERE TO PARK THE CAR. Car Share has reserved spots in all of the garages where they are parked. Most of the time it’s really simple to re-park in the same spot. I had one instance in the Pershing Square garage where I came in from a different side and I couldn’t quite figure out where the reserved spot was again. I also forgot the number of the reserved space. Oops. Luckily there was a nice man working in the office that pointed me in the right direction. Thank you nice man. And there you have it. Car Share. Love it. Alright, I walk to work every day come rain or shine. As a side note, I find it funny but very sweet when I get phone calls in the morning from people asking if I want a ride to work when it’s raining. Thanks, but I’m good. I enjoy walking in the rain, getting that annoyed feeling when my shoes and the bottom of my pants get soaking wet and I have to turn on a heater to dry myself once I’m in the office. But I digress…. I’m never one to shy away from a challenge. I will say hello before the end of this week! I always wonder when walking through the streets of Downtown Los Angeles who has the right of way. Sometimes I get the feeling that I’m playing Frogger but trying to dodge people instead of cars. It’s a fun game to play. Sorry dad, but at least I’m carrying on your mission of bringing a little Texan hospitality to Los Angeles. In all this morning, I said good morning to five people: three said good morning in return, one looked at me like I was slightly crazy, and one said something slightly offensive. What can I say, it’s a social experiment.